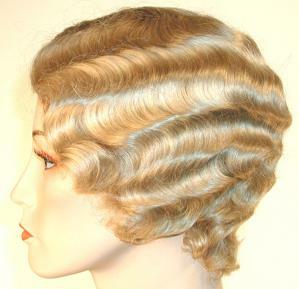 Everything is coming up roses in this Mae West inspired finger wave short wig. Throw all your cares behind you, as you don this timelessly traditional hair style. With ten colors to choose from, this flapper style wig will fit most, and with a wig cleaning kit, you are able to take care of your lady locks with ease and simplicity. This is the perfect wig for Roxy Heart in the Tony Award Winning musical, Chicago. Or, you can put it on for an easy up do for Bonnie, with the Bonnie and Clyde outfits. Whatever your choice, enjoy it.